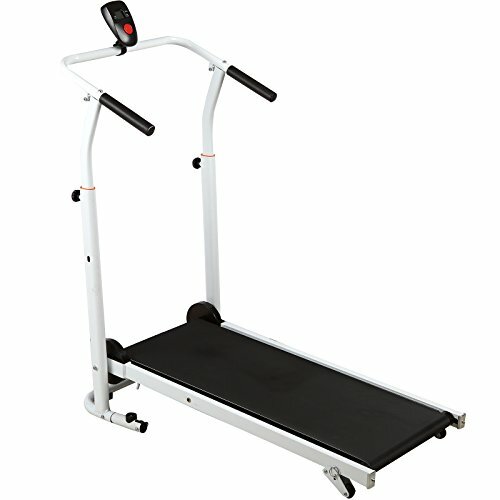 The FitnessClub Folding Manual Running Treadmill can help you get moving to a healthier you. With a motorless, energy-saving design, you'll be able to achieve your fitness goals without plugging into an outlet or the noisy motors. The slip-resistant belt and rails offer stability as you work out in your preferred speed. An LCD console records your calories burned, time and distance travelled to help you keep tabs on progress. *Runway size: 36.6" x 14.2"
*Overall dimensions: 41.3" x 20.9" x 45.3"
*Folding dimensions :14.6" x 20.9" x45.3"
MULTI-FUNCTION-- With a LED Display Screen Track your time, speed, distance traveled and calories burned to help you keep tabs on progress. ENERGY SAVING--Requires no Monitor or electricity, Enjoy the convenience of walking/running on a compact Green Technology Treadmill, without the worry of noisy motors. ADJUSTABLE INTENSITY --Adjust workout intensity by choosing 2 different incline positions, Climbing Mode/Mountaineering Mode. ENVIRONMENT FRIENDLY--Portable/Flodable design, this fitness machion features dual-weighted flywheels for smooth workouts, No electric outlet needed and no motor to maintain so it can be used anywhere. If you have any questions about this product by Artist Hand, contact us by completing and submitting the form below. If you are looking for a specif part number, please include it with your message.